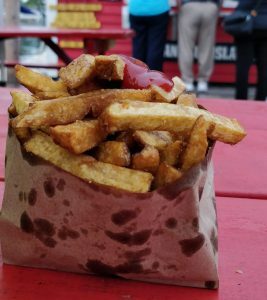 Vegan MoFo 2018 – Lets talk about fries. – vegan in your city. Home vegan mofo Vegan MoFo 2018 – Lets talk about fries. Vegan MoFo 2018 – Lets talk about fries. 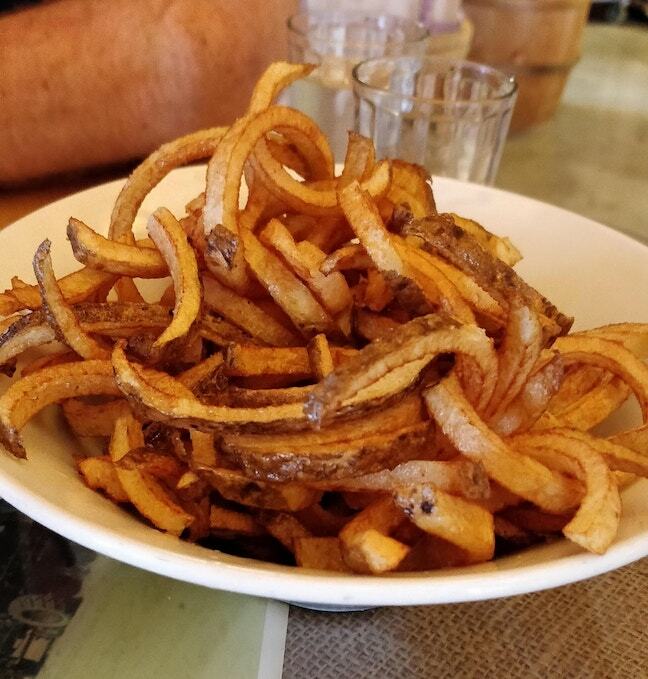 So french fries are a common inside joke in veganism, because once upon a time, it was the only thing we could eat out and about – and of course, it’s still occasionally the case. Impassioned online and offline discussions have happened related to fries and whether they are vegan or not, if the oil is shared, or McDonalds’s fries in Canada vs the USA, and whether they are healthy or should be included in veganism at all. Well, as you may already know, I think all plant based foods should be welcome under the umbrella of veganism, since food can be a joy and a pleasure as well as something that nourishes us. Fries can be wonderful. 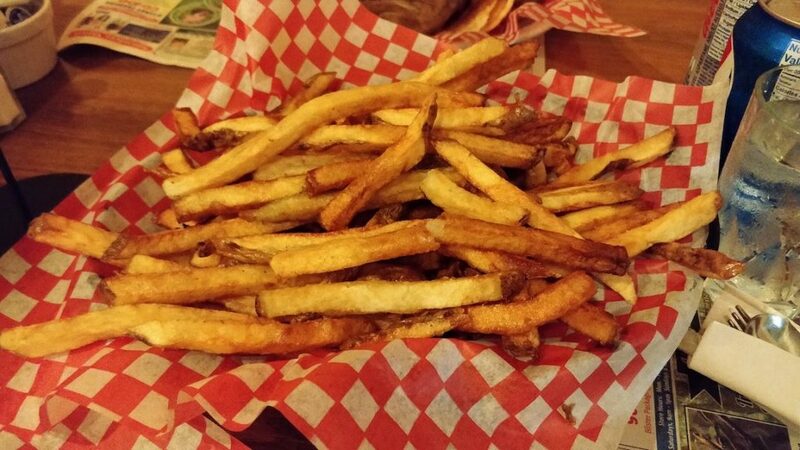 Fries don’t have to be a terrible joke all the time either – sometimes, they can be a happy one. My travels around have taught me that. Have you ever gone on a road trip and stopped at a chip truck in a small town? This wasn’t something I was familiar with living in the prairies, but once I moved to Ontario – chip trucks were a fairly common sight. And you could get fries – in a styrofoam box or paper bag, and eat it on the side of the highway while listening to the passing big rigs. Maybe big rigs are not your scene – but as I have learned over the past few months – some toddlers love trucks – and my toddler loves trucks, so watching them drive by can be a lot of fun. Another thing that is fun? Museums. And luckily – and topically – we went to a couple of potato museums this summer, and both had kitchens featuring, unsurprisingly… potato dishes. One was better than the other, and the food options, especially vegan ones, were better at one museum, but the great equalizer was fries. Both had cut fries. Both were awesome in their own way – and both made me wonder if there were ketchup museums (p.s. yes there is). When we were in Charlottetown, PEI, we also visited two waterfront french fry places. 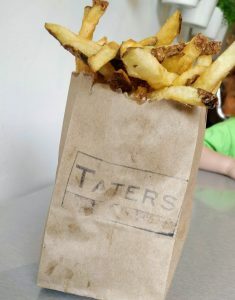 These were spots that mainly did fries and nothing else – though the Chip Shack did other things, they didn’t make anything but fries while we were sitting there for an hour or two – people like us were there just for the fries. Both spots made the fries in house with local potatoes, and one spot had a mechanism with the metal fry press attached to the wall, for easy fry making. 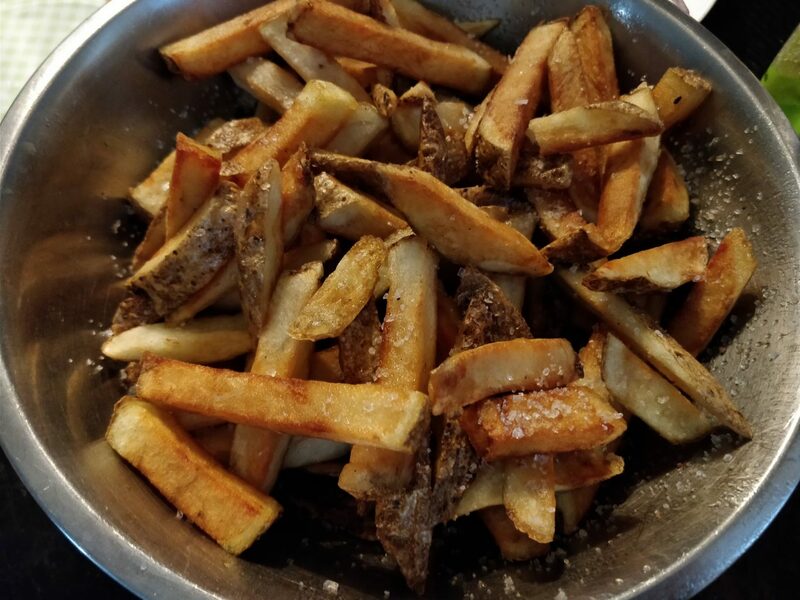 simple, slice potatoes, blanche potatoes, throw them in the deep fryer, and voila, you have french fries that are delicious and perfect, a little salty, with more salt on the side. Back in my pregan days, I used to love the fries supreme from taco bell. 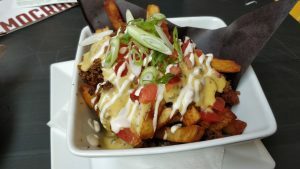 Luckily, there are several places in Ontario that make a vegan version like Toronto’s Hogtown Vegan’s Fries Supremacy, and Hamilton’s Democracy’s vegan Fries Supreme. If you find yourself in either of these places, I’d recommend checking them out! but finally, my favourite fries of all – homemade! I have fond memories of when I was little, watching my dad make french fries at home. Some of those times were from a bag, but the extra special times were when he’d make them from whole potatoes. Knowing this, a few years ago JC bought me a french fry slicer, and I have made fries at home a few times, since then. frying them twice in a light vegetable oil. 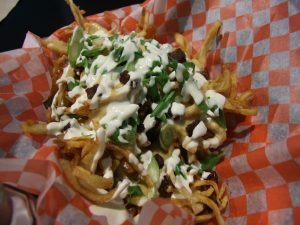 There are lots of recipes for homemade fries out there, but here is one from The Comforting Vegan, during veganmofo 2013. I love the idea of going to a potato museum! Do you distinguish between fries (skinny, straight, McDonalds style) and chips (big, fat, hearty) like we do in the UK? Because fries are good, but I’m all about proper chips! all potatoes are good and proper! though I don’t particularly like shoestring cut potatoes. 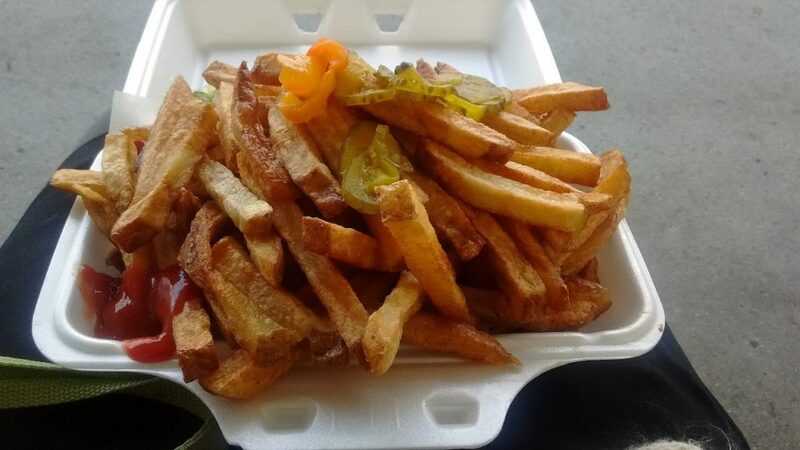 When I first went vegan, most chips were either cooked in animal fats in restaurants, or had been pre-impregnated with animals fats before they got to the restaurant (if they didn’t make their own), so finding chips I could eat was super exciting. Because I love potatoes! Now there are a lot of chip options available to me. And on a rainy day, I love going up the road to the local shop for an order of ‘minimum chips’. I actually don’t know what maximum chips would be. If you order $5 worth of chips, you get SO MANY. Minimum chips is normally about $3. But maximum chips…. FEED THE WORLD! I must ask one day. I would love to go to a potato museum! It’s fascinating all the different styles of fries and variations between countries and even regions. I’m from the North West of England where we have chippies (fish and chip shops). You get a tray of fat chips/fries and then drown them in gravy or curry sauce whereas in the South of England they eat them without any sauce. Hear, hear! I’ve had a fair number of fries + salad dinners at restaurants that weren’t particularly veg-friendly, but honestly… I’ll never complain. <3 fries!